Our Margaret (DRAKE) is known to have hailed from Balrath near Kells in County Meath. Her father was Patrick who was a farmer. This data is contained in the Marriage Cert dated 1868. According to the census data Margaret bore 12 children, 10 of whom survived beyond infacy. 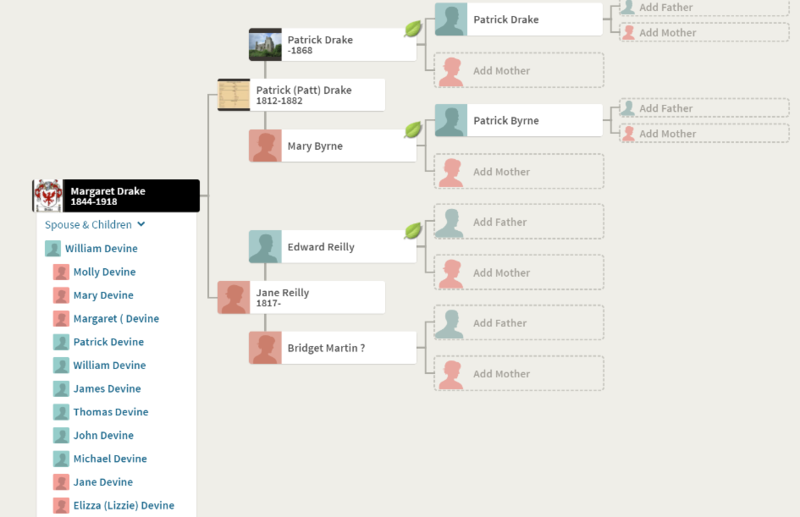 There are various accounts as to the origin of the DRAKE family. It is possible they started out as DRACC in Normandy in France. Travelled to the south of England and became DRAKE. It is believed they arrived in Ireland in the 12th century and accumulated enough wealth to build themselves a castle near Kells. A castle at Drakerath (158) in Staholmog parish and Kells barony is depicted on the Down Survey (1656-8) barony and parish maps (http://downsurvey.tcd.ie/). According to the Civil Survey (1654-6) John Drake of Drakerath owned 360 acres there in 1640 and ‘an old castle’ was on the property (Simington 1940, 310). The castle is depicted as one structure in a farm complex on the 1836 ed. of the OS 6-inch map and as a fragment of wall on the 1908 ed. It is on a slight rise in a fairly level landscape but is not visible at ground level in pasture.